About three weeks ago we featured a comprehensive tutorial for doing high speed bullet photography. 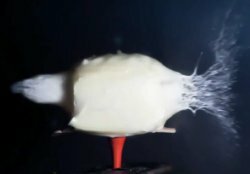 In that post, Maurice Ribble explained how to use a $195 camera Axe to literally freeze a bullet in mid air (or in mid egg, or in mid cantaloupe…). PS – if you are worried about getting the lights off in the right time, check out Matt Richardson’s video and circuitry for a smart camera / light / flash using an Arduino kit.